Wood Fire Hot Tub - Stress Relief From A Bit of Classic Wooden Hot Tub Luxury! Wood Fire Hot Tub – What A Great Way To Relax Under A Beautiful Starry Sky! How do Wood Heater Hot Tubs Work? Are Wood Fired Hot Tubs Difficult to Maintain? What Am I Looking at for Wood Fire Hot Tub Pricing? These Models Sound Great, But are They Any Good? Once you experience the joys of a wood fire hot tub, you’ll be hooked; there’s no doubt about it. 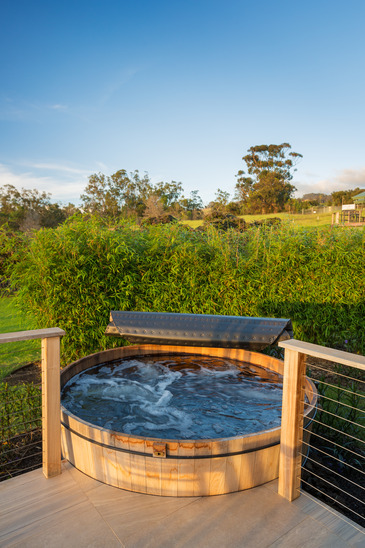 Indulging in a nice, warm bubble bath is great, but no garden tub can quite compare to sliding chin-deep into the super-heated depths of a wood fired hot tub. Of course, they’ve also received rave reviews from a number of directions for their health benefits. It’s no secret hot tubs offer their occupants a number of health-related benefits. Heat holds the power to soothe the stiff, aching joints and muscles resulting from a hard day’s work. Water gives those experiencing mobility issues the ability to participate in exercises far too painful without added buoyancy. When you combine the two, you gain near-incomparable physical therapeutic advantages. Beyond those basic aspects, high water temperatures and powerful jets act in conjunction to increase blood flow. This is said to benefit diabetic patients by lowering blood sugar levels and improving circulation. From chronic medical conditions to simple random overexertion, hot tubs have the capacity to ease pain and induce relaxation. If you feel better physically, you’re bound to sleep better and wake up every morning with a more positive outlook on life. Hot tubs can melt away the stress of everyday life and even help prevent its return. When you choose to bring a hot tub into your own home, you’re giving your family the freedom to enjoy its benefits whenever the need arises or anytime the mood strikes; besides, doing so saves you a great deal of hassle. Finding a venue with hot tub availability and waiting in line for your 15 minutes in the limelight can cause more stress than it eliminates. Then, there’s always that concern over how well sanitation is maintained in public hot tubs plaguing your thoughts. When it comes to purchasing a hot tub of your own, it’s really not a question of whether or not you should; it’s more a matter of which one best meets your needs. When hot tubs first hit the U.S. market, shoppers only had a couple models from which to choose. Your options have expanded considerably since then. Now, you’ve got a multitude of choices to consider. Permanent in-ground versions and those designed to become a permanent fixture inside your home could take days to sort through in their own right. Portable models have taken over the market of late, giving buyers more affordable options as well as more freedom of choice where placement is concerned. In this realm, acrylic and wood hot tubs are your two most advantageous materials with fiberglass likewise offered, but you also need to mull over yet another point. Most of your portable hot tubs are either fueled by electricity or gas; however, a lesser-known option is available. Wood has been used for cooking and heating homes for millennia. People were taking advantage of what the forest has to offer well in advance of mining for coal or tapping into our planet’s supply of natural gas. Wood certainly found its place in people’s hearts long before the power of lightening was harnessed and made available for the purpose of convenience. Few are willing to argue its clean-burning benefits when compared to the alternatives, either. Some would say using a readily available natural resource with a low carbon footprint to reap the benefits of heat and water therapy just makes sense. Wood fired hot tub reviews from current owners often praise their temperature consistency as well as lower cost of operation. Since you don’t need gas or electricity, the only costs you’ll encounter are water and firewood. Hot water naturally rises, pushing cold water deeper in the process. At some point, you’ve probably dipped your toe into a swimming pool or lake to give you an idea of whether or not full immersion was a good idea. While the water seemed warm enough to that one toe, going all-in turned out to be a different story altogether, didn’t it? Wood fire hot tubs operate based on that principle, but they eliminate the problem of uncomfortably cold water below the surface. Using wood burning heaters, these models draw cold water from the bottom of the hot tub into a heating chamber, the setup of which differs greatly among various models, and propel it back out into the tub. Since the water is continually being heated, it’s essentially pushing warm water downward, forcing out the cold. Water circulates itself without the need for electricity. In a nutshell, the answer is no. You’ll need to clean your hot tub per its manufacturer’s instructions. Acrylic models tend to need a bit more attention than their wooden counterparts in this regard, but fire heated hot tubs give you an extra advantage over conventional options. With gas and electric hot tubs, one of the biggest concerns you’ll encounter is chemical treatment. You reuse the water for an extended period of time, typically adding in chlorine or bromine to rid the tub of any unsavory elements looking to make their homes therein. Wood fired hot tubs are meant to be drained and refilled after only a few uses, so there’s no need for chemicals. Incidentally, those chemicals designed for sanitation are also significant factors in just how well your hot tub holds up over the years. They eat away at the surface of acrylic models, and improper balance is often responsible for wear and tear on wooden versions. If you choose a wood burning option, you may find your wood fire hot tub lasting longer. As is the case with all types of hot tubs, wood fire hot tub models come in a wide range of prices. Construction materials and added features play a role in just how much you’ll spend. In general, you could pay anywhere from $1,500 to more than $10,000 depending on size as well as a number of other factors. Following are reviews of three of the industry’s most popular wood fired hot tubs for sale. ALFI’s answer to the wood fired hot tub market is made of fiberglass and is among the most simplistic models, which also lands it near the lower end of the pricing spectrum. This model operates on an open-fire heating system encased in metal coils. Its design includes a metal windscreen to shield occupants from the flames. A metal pan for catching ashes and embers escaping from the fire is also provided, making cleanup no more complicated than emptying your grill after a barbecue. Another member of the ALFI fiberglass lineup, this model is a variation of the previously described option. Like its yellow counterpart, the olive green wood fire hot tub is fueled by an open flame and includes a clear cover to keep debris out of its estimated 200 gallons of water as well as a screen for protection. It also features ALFI’s signature food and beverage ledge for easy access to treats while enjoying a nice soak. Both the yellow and olive green wood fire hot tub varieties are filled via a standard garden hose. Water is said to heat up to 100 degrees in about two hours, and temperature is controlled by simply raising or lowering the fire basket. The OG model is a bit more expensive than the YE version, but both are well below the top-dollar mark for hot tubs in this category. Manufactured by the Northern Lights Group, this wood fire hot tub is made of cedar. NLCT’s model rivals the ALFI OG fiberglass option where price is concerned but offers a bit more interior depth. It comes with an enclosed stainless steel heating system as opposed to an open-flame design and includes adjustable bench seating. A locking insulated cover is included with purchase. Each of these top-selling wood fire hot tub models gives its owners the famous benefits of regular wood fire hot tub use while providing the efficiency, economic advantages and ease of maintenance for which wood fired hot tubs are so well known. ALFI’s contributions to the market generate a bit of a retro look and feel, whereas NLCT’s offering features the aesthetic appeal of wood. All are portable, so they can easily be moved from one area to the next or taken along with you if you decide to move. They’re also more affordable than many other options on the market. While the NLCT enclosed heating system may be more desirable for families with pets and small children when in use, due attention to safety precautions is always recommended. We recommend one of the Alfi Wood Fire Hot Tubs if you are looking for a modern-style freestanding hot tub for 1-2 people ( or an adult and 2 small children) , and one that you can easily move from lawn to deck – in fact to wherever you like. It is not particularly cheap, but it is good quality, and that means you are getting a product that will last and give you good service. If you are looking for a more traditional, rustic-style wood fire hot tub with a bit of luxury then you can’t go past the cedar Northern Lights model. It looks great, and has a wider range of features than the Alfi models. It also seats 4 people – great for your next party or romantic evening under the stars! This entry was posted in Wooden Hot Tubs on by Luke.